Archbishop Oscar Romero was killed while celebrating the Eucharist 30 years ago today (March 24, 1980). In memory of this great man, here is his prayer / poem, "A Future Not Our Own". a step along the way, an opportunity for the Lord's grace to enter and do the rest. As Bill Raftery would say: "ONIONS!" "You could replace the word postal service with the word newspaper business and have the same conversation. None of them (newspapers) will be here in ten years. I understand that I'm part of a generation that's dying, and I don't want to do this stuff on-line because of my vague distrust of the Internet. Though I buy things on-line occasionally, I bemoan the fact that I buy things on-line. A hundred years from now, somebody is going to write that the Internet is second only to fire in changing the culture. You would think it's the airplane or the telephone. No, no, no, no, no. It's going to be the Internet. The Internet is having the most profound social changes (many for ill, in terms of the social discourse)...but the changes are astonishing!" "The truth is no online database will replace your daily newspaper, no CD-ROM can take the place of a competent teacher and no computer network will change the way government works... The Internet is one big ocean of unedited data, without any pretense of completeness. Lacking editors, reviewers or critics, the Internet has become a wasteland of unfiltered data." "A rose shall spring forth from the root of Jesse, its splendor, our hope, a glimpse of heaven above. A rose shall spring forth from the root of Jesse. Its fragrance will be the essence of God’s love." I am reminded of this song as I reflect on the Lifelong Learning Partners event that concluded today in Carefree, AZ. This was the first LLP conference for 23 of the 50 people who attended. Members of the LLP network were encouraged last year to “invite someone half your age” to be present in 2010. It was a joy to be included as one of the “token young people”; mainly because I never felt like a token anything while I was there! We were an odd group in that about half of us were 55+ years old and the other half were younger than 35 years old. During our intense conversations, I was reminded of the unique challenge that faces many ELCA churches -- the challenge of being intergenerational. A large number of our congregations have four generations of people who come together to do and be church. Because of this fact alone, it is no small miracle that the church continues to exist in its present form. That said, I’m often critical of people who get in the way of effective ministry. I grow tired when going-through-the-motions gets confused with “sacred practices”. I fear for the imminent death of our church when people get more upset about jeans in worship, which hymnal to use, or the kind of coffee we have than when young families flock to theologically bankrupt congregations just because they don’t feel welcome in our congregation. Fairly or unfairly, I blame the Baby Boomers (and older) for a lot of problems facing our church. 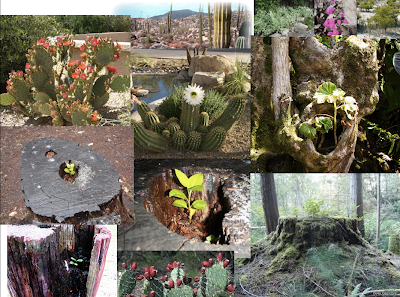 I was reminded that something which appears to be dead - like the line of Jesse, a cactus, a tree stump, or a denomination - is able to give life to something new. I was reminded that grandparents and great-grandparents care deeply about the vitality of our churches and that they want to be part of its renewal...they just might not know how to make it happen. The nutrients are there. The soil continues to be fertile. New life can and does come from things that are almost dead. But how do we do it? What conversations need to take place? What questions need to be asked? How can the "old school" people and institutions that continue to serve as leaders in the church help to foster new growth from what (at times) appears to be nothing more than a dead stump? Whatever comes of this new thing, "its fragrance will be the essence of God's love". "Research published in 2009 in BMC Research Notes found that study participants who played Tetris showed increased brain efficiency and, relative to controls, an increase in brain tissue." Given the amount of Tetris that I play, my brain tissue must be the size of Texas.